wrong, her car skids off an icy road and plunges into a frozen lake. There, in the cold dark depths of the water, a profound and extraordinary experience unlocks the surprising secrets from Sophie's past, and teaches her what it means to truly live...and love. I began this book as a way to get into a new genre of reading and it thrilled me from page one to the end. I would not have put it down as often as I did except that I had other things to do each day but would make sure to go back as often as I could until I finished it. This story was a wonderful read that is well written and engages the reader from page one. Emotional and poignant, well worth reading over and over and sharing with friends! I would recommend books by this author to all my friends that read this line of books. This line of reading is a refreshing change from the type I am use to reading. I look forward to reading more books by this author. 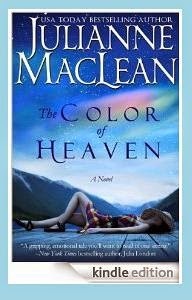 THE COLOR OF HEAVEN is a work of fiction and was a USA Today bestseller. Disclosure: I purchased this book through Amazon.com. I chose to post the review because it is a book I enjoyed and felt my readers would love as well. All my reviews are my honest and personal opinion. I am disclosing this in accordance with the Federal Trade Commission’s 16 CFR, Part 255: “Guides Concerning the Use of Endorsements and Testimonials in Advertising.”.